According to the trafficking protocol by the United Nations, human trafficking is defined as the recruitment, transportation, transfer, harbouring or receipt of persons, by means of threat or use of force or other forms of coercion, of abduction, of fraud, of deception, of the abuse of power or of a position of vulnerability or of the giving or receiving of payments or benefits to achieve the consent of a person having control over another person, for the purpose of exploitation. Exploitation shall include, at a minimum, the exploitation of the prostitution of others or other forms of sexual exploitation, forced labour or services, slavery or practices similar to slavery, servitude or the removal, manipulation or implantation of organs. Human trafficking is a crime against the person because of the violation of the victim's right to movement through coercion and because of their commercial exploitation. In 2014 the International Labour Organization estimated $150 billion in annual profit is generated from forced labour alone. India is also a destination for human trafficking. In the year 2016 alone, 8132 human trafficking cases have been reported in India. Rediff Labs analysed the human trafficking section from crimes data 2016 by National Crimes Record Bureau, India. The map above shows the state wise number of human trafficking cases reported in 2016. Here the size of the circle represents the mid-year population of 2016. The states where the cases reported high are West Bengal, Rajasthan, Gujarat, Maharashtra and Tamil Nadu. The states where the cases reported low are Andaman and Nicobar Islands, Chandigarh, Sikkim, Arunachal Pradesh and Mizoram. 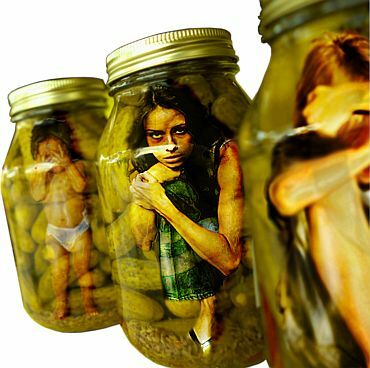 Human trafficking is the trade of humans for various purposes like forced labour, sexual slavery or commercial sexual exploitation for the trafficker or others. It can occur within a country or trans- nationally. The main purposes for human trafficking given in the NCRB report are Sexual exploitation, Forced Marriage, Forced Labour and Domestic servitude. The chart above shows the purpose of the human trafficking and the top ten states for each purpose. For the purpose Sexual exploitation Madhya Pradesh is in the top place followed by Tamilnadu and Maharashtra. For the purpose of Forced Marriage the state West Bengal is in the top place followed by Madhya Pradesh and Gujarat. For the purpose of forced labour the state Rajasthan is in the top place followed by Madhya Pradesh and Tamilnadu and for the purpose of domestic servitude Madhya Pradesh is in the top place followed by Delhi and Uttar Pradesh. When there is multiple purpose for trafficking the people are also getting rescued. The below charts shows the percentage of people trafficked and rescued in 2016 in India. The above chart shows that the females of age below 18 years or above 18 years are trafficked more than males irrespective of their age. But males at the age less than 18 are more vulnerable towards human trafficking compared to the males above 18 years. The above chart shows the percentage of people rescued in 2016. For the people age below 18 years males are rescued more than females. But it is opposite in the case of people of age above 18 years where females are rescued more than males. The females below age 18 years were majorly rescued from sexual exploitation in the states of Gujarat, Madhya Pradesh, Mizoram and Sikkim. The other reasons from which the females below 18 years were rescued are forced labour in the states Jharkhand and Kerala and from domestic servitude in the state Chandigarh. And the males below 18 years are rescued from forced labour in the states Bihar, Delhi, Punjab, Rajasthan and Uttar Pradesh. The females above 18 years were majorly rescued from sexual exploitation in the states of Andaman and Nicobar Islands, Andhra Pradesh, Assam, Goa, Haryana, Himachal Pradesh, Karnataka, Maharashtra, Meghalaya, Telangana and Uttarakhand. And the males above 18 years are rescued from forced labour from the state Odisha. So the major reason for trafficking females is for sexual exploitation and in males is for forced labour irrespective of their age. In India, the trafficking in persons for commercial sexual exploitation, forced labour, forced marriages and domestic servitude is considered an organized crime. The Government of India applies the Criminal Law (Amendment) Act 2013, active from 3 February 2013, as well as Section 370 and 370A IPC, which defines human trafficking and "provides stringent punishment for human trafficking; trafficking of children for exploitation in any form including physical exploitation; or any form of sexual exploitation, slavery, servitude or the forced removal of organs." Additionally, a Regional Task Force implements the SAARC Convention on the prevention of Trafficking in Women and Children. R.P.N. Singh, India's Minister of State for Home Affairs, launched a government web portal, the Anti-Human Trafficking Portal, on 20 February 2014. The official statement explained that the objective of the on-line resource is for the "sharing of information across all stakeholders, States/UTs[Union Territories] and civil society organizations for effective implementation of Anti Human Trafficking measures." Provide connection to "Track child", the National Portal on Missing Children that is operational in many states. Also on 20 February, the Indian government announced the implementation of a Comprehensive Scheme that involves the establishment of Integrated Anti Human Trafficking Units in 335 vulnerable police districts throughout India, as well as capacity building that includes training for police, prosecutors and judiciary. As of the announcement, 225 Integrated AHTUs had been made operational, while 100 more AHTUs were proposed for the forthcoming financial year.